Gripes: Rather drying, unhygenic pot! Jenn's Rating: 1 Star - Into the Skincare Hall of Shame this goes! Ricinus Communis (Castor Seed) Oil, Lanolin, Polyglyceryl-3 Beeswax, Flavor, Beeswax, Hydrogenated Castor Oil, Silica, Benzyl Benzoate, Citrullus Vulgaris (Watermelon) Seed Oil, Tocopheryl Acetate, Ammonium Glycyrrhizate, Benzyl Alcohol, Tocopherol, Methyl 2-Octynoate, Titanium Dioxide, Yellow 5 Lake, Red 7 Lake. 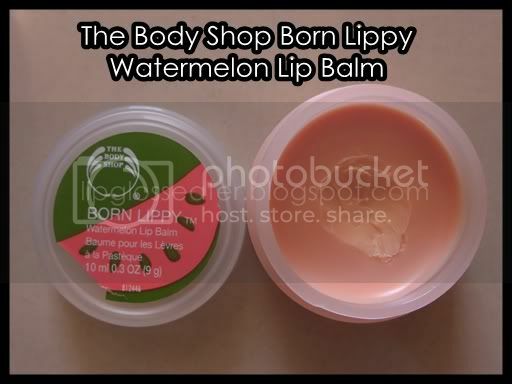 Best if you want to: Enjoy a slice of summer and mouthwatering watermelon flavor with a moisturizing and glossy lip balm that leaves lips soft, smooth and kissable. 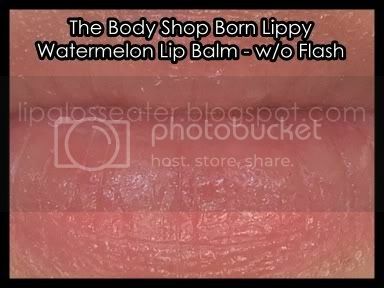 Melon seed oil conditions lips. Community Trade organic beeswax moisturizes and conditions lips, while acting as a barrier that helps seal in moisture. No petroleum jelly means lips aren't stripped of moisture. The balm spreads on like butter on my lips! The scent does smell like a fresh, juicy piece of watermelon! :D Do not lick your lips if you have this on though, there's a nasty plasticky taste to it!! This balm is a baby pink in the pot, and it goes on as a sheer milky pink on the lips. This lipbalm comes in a plastic pot that's slightly larger than a 50 sen coin with a screw off lid. As i have mentioned before, I really dislike balms that come in a pot because it's such a pain having to carry a separate lipbrush around. Don't even mention about sticking your fingers into the pot... that's just so GROSS!! This lipbalm barely lasted about 3 hours on my lips, which is slightly shorter that what i'd like! This balm is priced at RM15.90 when i bought it in 2005 (should be more expensive now?). 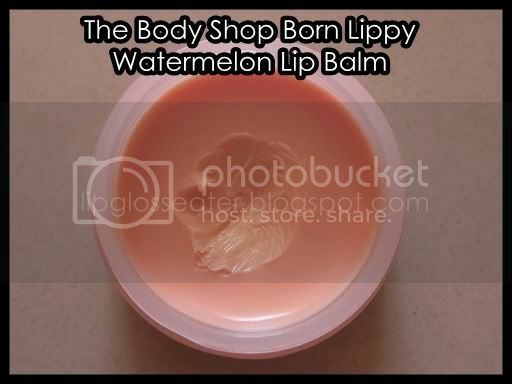 This balm is available at all TBS brick and mortar stores, as well as on the TBS website! I used this as a lip balm, but not any more since it dries out my lips! I'm really disappointed with this balm because it doesn't moisturize my lips! In fact, it dries them out after awhile and makes them really flakey! Furthermore, it comes in that little pot that looks cute, but is not hygenic and practical! It smells great alright, but that's about all what's great about it that i can say. I do not recommend anybody to buy this! 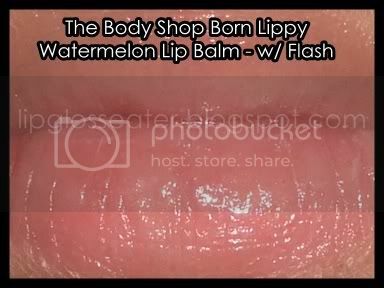 Credits: Product photo from Thebodyshop-usa.com. I wont recommend this product as it doesnt help your lips in any way,it gets tried away very quickly and doesn't last long. MAC Dame Edna Collection now online! Tag: Friendship Award and Survey! MAC Chill Collection now online! Jenn Asks: Are you a Brand Concious person? MAC Brunette Blonde Redhead Pictures!! What Goes First: Moisturizer Or Facial Oil?